A superb-looking handset that offers something brand-new, but there's still a way to go for the curved, second screen experience. 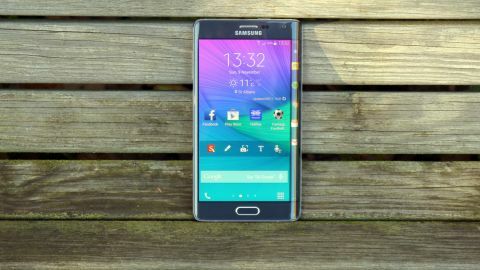 The Samsung Galaxy Note Edge is a phone that's got me hot under the collar. It's another evolutionary step forward in the way we're going to be using phones, right? I mean, it has to be. The rounded spine, with the screen curving away and tucking itself under the chassis, is surely the blueprint for the upcoming Samsung Galaxy S6. Well, that is, assuming the idea of a curved display on one side isn't a novelty and redundant beyond being a clever marketing gimmick, of course. And it needs to be more than that. Early prices seem to have the Note Edge at around £50 more than the impressive Samsung Galaxy Note 4, with the curved model costing a huge £640 if you shop around, while the £700 RRP is even more wallet bothering. Is the curved screen worth it? Of course there's more on offer here that makes the Edge a really promising device: a huge 5.7-inch QHD (1440 x 2560) screen even without the curved spine is really pleasant to look at. That's also coupled with Samsung's Super AMOLED technology, which again makes the Note range the best phone screen I've seen on the market. The camera is improved, the S Pen is starting to show glimmers of offering really useful functionality to the average consumer (not just the business warrior hell-bent on dropping the notepad) and the raw power of the Snapdragon 805 chipset (or the octacore Exynos option from Samsung) means this phablet can go on, and on, and on. And while Samsung unquestionably created the phablet market, it's now got some serious competition to contend with. Apple's new iPhone 6 Plus is some people's idea of 'the only large phone' on the market, and the Google Nexus 6, while not mega-cheap as before, is still a very well specified device without the need for bells and whistles. Samsung's also facing a profits slide that it's desperate to arrest, and that will only be achieved through going back into its R&D labs, putting on a stylish thinking cap, and coming up with something truly innovative that wows the public. Last year's Galaxy Round, the brand's first curved display in a phone, was a step towards that but didn't really do much beyond, well, being a bit curved. The Note Edge combines an innovative design with actual real-life usage, which means it could be more of a hit than Samsung's other novelties and now that LG's announced the G Flex 2 it really looks like curved screens could be here to stay. Let's get this out of the way first: you won't like the Note Edge the first time you pick it up. I almost want to applaud Samsung's designers for taking such a bold step, keeping the same high resolution display from the Note 4 but then adding in a few more pixels to bring us this clever spine which can independently show information. But the problem is the phone gets wider as a result, and you really feel like you need to wedge it into one palm. It's true that any phablet performs better when held in two hands, but when pulling out the S Pen from the bottom right hand corner (which pleasingly can be pushed in either way, a feature Samsung added in with the Note 3 and has removed tremendous frustration with Samsung's phablet series for me) you still have to hold the phone steady in one hand, which can be a little tricky. That said, there is an acceptance that the Note Edge is going to be a larger device - after all, that's why you're buying it, right? - and it doesn't take more than a few days to really get used to the idea. By putting the digital spine on the right hand side of the phone though, Samsung was forced into a big design decision: where does the power button go? Sadly, it didn't make the right call, as the unlock key has been moved to the top of the device where it lived many moons ago. With a phone that measures 153.5 x 78.6 x 8.5 mm, this is mightily hard to hit and means you have to use two hands to lock the device. Hardly the easiest. It should have either been on the left hand side, or nabbed something from South Korean rivals LG and plopped it on the back. Failing that, Samsung should have joined the swelling ranks of smartphone manufacturers allowing you to double tap the screen to wake the device. It's not a patented idea, and thankfully it's baked into Android Lollipop (which is arriving soon for this phablet) so could be an option. The good thing that slightly helps is the home button, which again doubles as a fingerprint scanner, will allow you to unlock the phone and get swiping straight into the action. In terms of the rest of the design, it's typically Samsung. Anyone that's read any of the other reviews will realise that's not necessarily a good thing, but it's not terrible either in this case. The metallic rim of the Note 4 and Alpha are missing, presumably to add in the curved spine on the right side, but the overall build quality is good, the frame surrounded by a strong case and there's very little creaking. I'm not a fan of the leatherette feel of the back cover, but it's removable again and allows you to swap the battery and microSD cards easily, which I'm pleased to see Samsung continuing with. The infra-red port and headphone jack both reside on the top of the device, making it easy to use the Note Edge as a daily media device, and the speaker (which I'll talk more about in the next section) is placed towards the bottom of the phone on the rear. The camera on the Note Edge (a 16MP) affair) protrudes quite dramatically from the back of the phone, although not to the point that you'd notice it in the pocket. It's weird how much other phone brands can get away with the camera unit sticking out the back of the phone when Apple gets castigated for a couple of millimetres, but I'm glad that's the case. I'd rather have a better snapper than an aesthetically more pleasing handset, and the Note Edge does both pretty well. The lightness of the phone, at 176g, is nothing to get excited about (it's actually one of the heavier on the market), but then again it's not too heavy either. In the palm it's nicely balanced, and pulling out the S Pen is an easy task thanks to the whole thing being so grippable. That said, I did find myself holding it in a weird way so as not to touch the spine in general use. I never really had an instance where I accidentally did anything with that element, but it didn't stop it being slightly in the way all the time.